Like most interconnects here, the Reference Audio 40 is a silver-plated copper affair, arranged in a special complementary way - the two conductors have different diameters, and this is said to give an alternative path for high-frequency audio signals to avoid time smear. The foamed polyethylene dielectric is claimed to reduce the amount of signal lost to cable capacitance. QED's Analoc plugs are fitted, said to be a low eddy current design with copper instead of brass used. They feature an outer locking cylinder that needs to be screwed forward before the plug's 'blades' can be locked onto the RCA phono socket, then the locking cylinder needs to tightened backup for a (very) secure fit. The Signature Revelation speaker cable uses 10 silver-plated oxygen- free copper central conductors, which are claimed to provide very low resistance alongside high levels of detail. These cores are separately insulated and arranged around a hollow core of polyethylene; QED calls this its Aircore technology and it's claimed to reduce inductance. Before the QED loom, the panellists have taken a mixed view of the various wires played to them. They've found positives and negatives, liked some and been lukewarm about others. But two out of the three listeners express a strong preference for this set of cables, applauding it for its clean, open, even sound that doesn't try to do anything too clever. Instead it is very accomplished at almost every facet of the music, and makes things look rather easy. 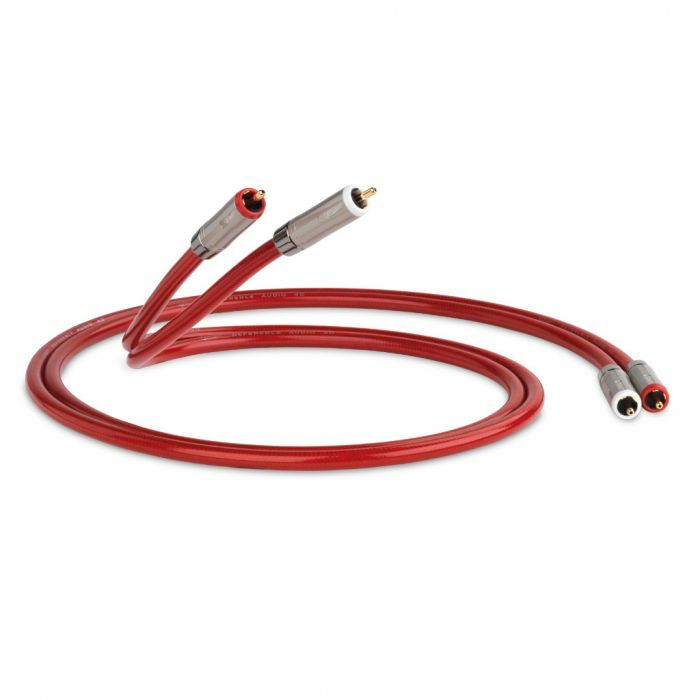 Reference and Signature Audio40 analogue cables use 'Analoc™' plugs with a built-in locking feature so that as the barrel is screwed up tight, the clamping force is increased making for a super noise free and secure connection. To correctly fit 'Analoc™' plugs, the outer locking cylinder of the plug must be screwed forward, to loosen the gripping 'blades', whilst the plug is pushed into place on the socket. The locking cylinder should then be screwed back in order to lock the plug onto the socket. Needless to say, users must always remember to do this when connecting/disconnecting the cables. There are three cables in the Audio 40 range representing the long established Performance, Reference and Signature designations which have always corresponded to the "good, better, best" principle of QED product hierarchy. * However the whole range has been developed using a strict top down approach which means that all three cables share an almost identical construction and geometry with the Signature cable representing the ideal 'cost no object' original state of the design with the Performance cable its cost engineered alternative. The Reference cable represents the perfect balance of performance against the law of diminishing returns omitting only the most expensive components. *Performance Audio 40 to be launched 2015. The cordage is designed primarily for low capacitance as this has been identified by QED as the primary factor which leads to a hi-fidelity experience and makes for a tight sound which retains the rhythm of the original piece. Further unique steps have also been taken to eliminate minute timing errors in the cable. Our new complementary conductor geometry is used throughout the range and utilises two conductors of different diameters to carry the same audio signal. This has the effect of providing an alternative path for high frequency audio components which might otherwise become time smeared in a single audio pathway. Another innovation added to the entire range is the specially impregnated PVC jacket containing 10% Zn/Mn ferrite material. This absorbs very high frequency noise signals and audio signal components which are thought to have an adverse affect on the micro-timing of the audio signal. Low dielectric constant materials such as foamed polyethylene or teflon have been used throughout the range to cut down on the amount of audio signal energy lost due to cable capacitance and all of these measures have been applied under the consultation of leading industry experts. We have been able to measure the affects of these improvements using our high frequency cable test suite. Additionally the new locking plug does nothing to spoil the low jitter, low noise signal provided by the cordage. The new QED Analoc™ plug is a low eddy current design featuring small high purity copper conductors in place of the usual large volume brass body found in ordinary high quality plugs. This cuts down or eliminates the tendency for the changing magnetic field in the conductor to induce eddy currents which can affect the micro-timing of the audio signal. Coupled with its hollow central pin, which is designed to combat the skin effect in the same way as our X-Tube speaker cables, the new QED Analoc ™ plug maintains the fidelity of the audio signal from start to finish. upon more basic implementations of the original RCA plug. Unfortunately there are a few problems with the use of bulk brass, the most prominent being its low conductivity compared to pure copper. Pure copper plugs would be prohibitively expensive and so are not used but if the high purity copper conductors were confined to just the pin section and the small contact areas required for the return ring then this would be economically viable. QED's new Analoc™ plugs take advantage of this idea and provide a high purity copper connection without the use of bulky brass plug bodies. The pin section is made from a hollow tube of high purity copper and the ground return is reduced to just two of the normal six leaves. This has the dual effect of providing a low resistance path for the tiny signal currents flowing in line level unbalanced connections and cuts out the possibility of eddy currents forming in the large volume of the plug body which would otherwise form part of the return path for the signal. Eddy currents are swirling circular currents which build up in any conductor where there is a variable magnetic field acting on it such as when an ac signal is applied. Eddy currents flowing in a conductor of a given resistivity necessarily dissipate energy and this energy loss is proportional to the square of the diameter of the conductor - so the smaller this can be kept, the less the effect of eddy currents on the delicate audio signal. Add to this that due to self inductance eddy currents can persist for a short time after the field is removed and always create a field that opposes that which creates them it can be seen that eliminating this phenomenon can lead to improved transmission of the audio signal - especially in the area of minute timing effects. Eddy currents give rise to the skin effect wherein the current increasingly flows towards the outside of the conductor as frequency increases. By removing the central portion of the copper pin section we have reduced eddy currents here also and thus combated the skin effect and reduced self inductance in a similar way to that employed in our X-Tube™ speaker cables. Because the contact area of the outer ground ring has been reduced it is necessary to provide a very firm connection indeed and so all Analoc™ plugs have a locking feature built in so that as the barrel is screwed up tight, the clamping force is increased making for a super noise-free and secure connection for life. The high purity copper conductors featured in the Analoc range come with gold plating at Reference level and rhodium plating for the Signature plugs. This plating is there to maintain low contact resistance throughout the life of the product due to the stability and low reactivity of these metals. Although copper is the second best electrical conductor (behind silver) it does react with oxygen and can tarnish over time increasing the contact resistance and therefore increasing distortion of the original signal. Rhodium has the advantage for use as a plating material due to its superior hardness. QED Analoc comes as standard on the Audio 40 interconnect range and can be purchased separately to be included in custom cable projects. The ability to accurately transmit high frequency impulses means that within the audio band timing and dynamics should be improved.